With a design that fuses both classic and modern shapes, the GROHE Grandera single-lever mixer has a sophisticated look that complements a wide variety of bathroom styles, from exclusive hotels to the home. It is also packed with pioneering GROHE technology. Engineered with GROHE SilkMove’s ceramic cartridges, controlling water flow and temperature is effortless and precise. It also has a medium high spout, which is a perfect height for washing hands. The GROHE AquaGuide aerator allows you to adjust the angle of the water jet so filling or washing pans has never been easier. With integrated GROHE EcoJoy technology it has a water-saving button that reduces water usage by up to 50% – an easy way for you to save a precious natural resource as well as money! Finished with our scratch resistant GROHE StarLight chrome coating, the mixer is easy to clean and will keep its sparkle for many years to come. And thanks to our easy installation system, this stunning tap can be fitted in the blink of an eye to give your bathroom a whole new look. 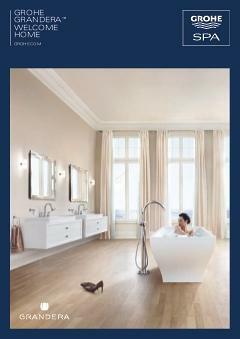 GROHE Grandera – unique blend of distinctive design and premium performance.